Designed to carefully balance composition, proportion and beauty, the Hinsdale Collection by Hudson Valley Lighting is as much a work of art as it is a functional light for the home. At first glance, Hudson Valley’s Hinsdale collection has a sense of playfulness, but there’s much more going on behind this carefully crafted design. Here, David Littman gives us an inside look at his brand and this new collection, available exclusively at Lumens. Tell us about the Hinsdale collection. We started it out as an art experiment, pairing a rectangular beam with vivacious orbs. In other words, as we identified what would go where, we were working within a compositional boundary, seeking out the arrangement which most pleased us, which resonated with that internal, noble sense of balance, poise, and proportion we all have. We were operating on the assumption it would hang vertically, at first. Then, we realized it limits the piece to just go vertically. You need a tall ceiling and a lot of space to hang it that way. One thing we really don’t like to do here is limit our customers. In fact, we pour a lot of intention and energy into inspiring our customers to think outside the box and enjoy the process of appointing lighting for their home. So, turning it sideways, we got the idea to create an island light version of this family. 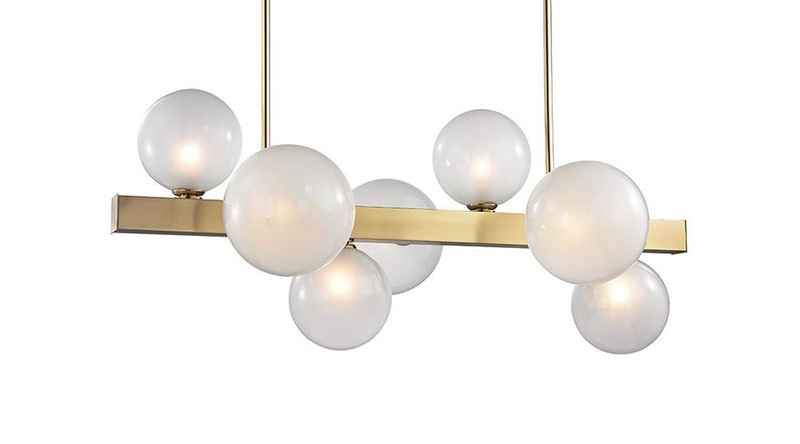 One of the details we’re really pleased about with this fixture is the glass orbs. It may not be immediately apparent from a picture, but these globes are clear on the outside and acid-etched on the inside. This is not a trend and it is not easy. It’s done by hand. Our artisans handle the glass spheres in a certain way to coat the inside for the etched effect, carefully pouring out the etching agent from the orb’s opening. When lit from within, this creates a great look. When you see it in person, you will love it. Where do you envision the Hinsdale? Is there a space you think it would work especially well in? The best answer would be anywhere you want a hanging work of art. For me, the first place that comes to mind is over a kitchen island. When we were initially designing the piece, we weren’t thinking of that space, in particular, since it had a vertical design. But that's how we came to design it it a horizontal orientation, as well. It seems like Hudson Valley Lighting is a great blend of modern and traditional styles. Do you align yourself to either one? How have you seen different tastes and styles come together over the years? We consider ourselves neither modern nor traditional. We try to take a pinch of something old and find a way to make it new, or, at the very least, improve upon it. We hope to set the trend. At the same time, we have a very real love and passion and respect for the history of design. Naturally, tradition plays a part. A good example would be how we began introducing two-texture fixtures, where there’s a contrast of rough, dark metal with the smooth, shiny finish of nickel or brass. That’s a look you see more now. You see it in a fixture like our Glendale Pendant, which stepped into that Sputnik tradition, and took it to a place it hadn’t been before. Where do you find inspiration for Hudson Valley designs? Everywhere and anywhere. We are constantly looking. We’re on the web; we’re in magazines; we’re antiquing. We travel the world and we are stalking flea markets, drinking in architecture, and seeking out old things. We’re turning things sideways and cultivating our sense of curiosity. "What if we took this mid-century French side-table and outfitted it as a lighting fixture? Could we do that?" "What if we added domes of rock crystal to it? What would we need to do? How can we make this both beautiful and functional? 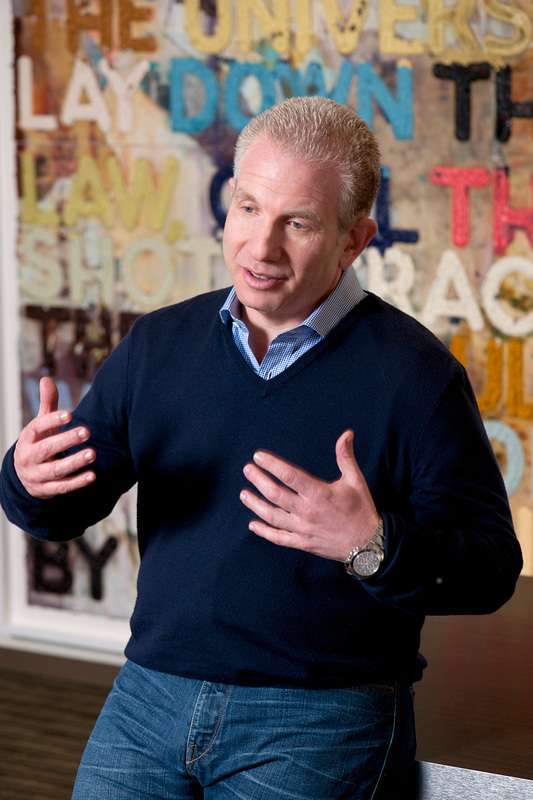 How can we deliver an attainable luxury?" Hudson Valley Lighting founder David Littman describes his style as "Masculine, mid-century modern, and a little hard-edged." Do you have a particular style/aesthetic yourself? My aesthetic compass points toward a sense of balance. I intrinsically recognize and respond to work where it’s clear all things have been considered and each decision or detail has a reason behind it. Quick adjectives? Masculine, mid-century modern, and a little hard-edged. How does that play into your work? At Hudson Valley Lighting, we both embrace that aesthetic and work against it. For example, in one of our more recent introductions, we made a conscious decision to bring aspects that are traditionally considered feminine into our work, to round out our collection. So we worked a lot of crystal in and explored different ways to use it. We try to marry those masculine and feminine aspects in one fixture, where you might have clear hard lines and angles complemented by sumptuous materials. Other times, like in our recent Sparta Chandelier, we might try to take an inclination or aesthetic to its maximal limit. 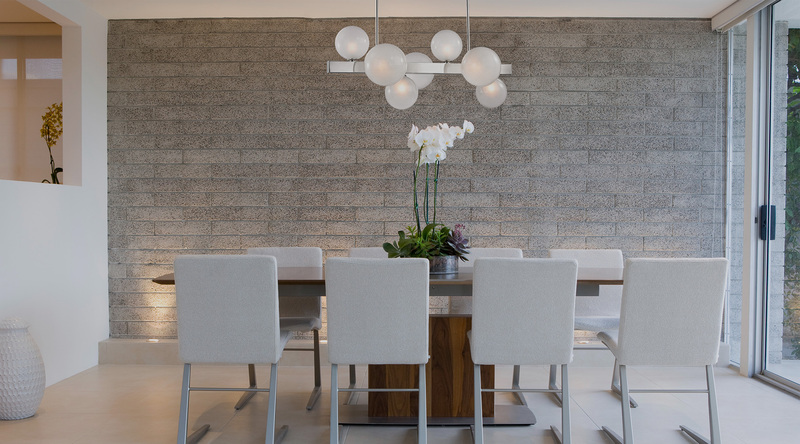 The Hinsdale Pendant has a vertical orientation available with 4 or 7 globe lights. What’s most important in a good lighting design? Details. A successful lighting design, for us, is one that is visually pleasing and that also does its job well, which is to illuminate spaces. While we are always thinking of the decorative aspect—form—we never fail to consider its function. When we get an idea going, we’ll tack some tracing paper up on the board over what we have so far and start playing with it. What details can we add that will make the piece more beautiful? What should be expanded or diminished to create a sense of proportion and equilibrium? We’ve done our job when we look at a piece we’ve made and feel that it is both a lighting fixture and a work of art. How do you design alongside changes in the lighting industry? We don’t really think of ourselves as being in the lighting industry. We think of ourselves as being in the design industry. We pay close attention to what’s going on in that world and we find a lot of inspiration there. Our first objective is to design something beautiful. From there, we do try to identify what’s missing in the lighting industry and address that gap. There is a lot of rapid advancement in the bulb industry right now, and that does affect us. For example, with LED bulbs getting smaller and smaller, while putting out more light at a warmer quality, we don’t need to allot as much depth to cover the bulb. In the instance of a design like our Paris Flushmount, this means we can design it to be much closer to the ceiling, which helps people looking for a gorgeous fixture for a tight space. For the most part, we continue to specify medium or candelabra sockets, knowing the bulb industry is doing a brilliant job with retrofitting. The LED-specific fixture is a small part of our offering. Again, we think in terms of beauty and design first and foremost.